Yes HolScaleGeek, the plastic vintage ones of the 1970`s and the metal ones are rare,and if I recall production of these stopped in 2001 and are quite hard to find. Although both set`s are not that valuable .The plastic ones were so cheap back in the day that little children chewed on E`m, or lost them or just throw them away. The Modern up to date,new ones are common place from the States or Germany. These can be obtained on Amazon UK too. E Bay is world wide so I`m surfing the Foreign Waves too.I had a quite a good plastic buy from Kuala Lumpur Malaysia. While viewing this shot of Asterix the Gaul and friend,I noticed the tiny Dogmatix can be seen sitting in the hand of Obelix. Gosh he is so tiny I almost missed him in this set. you notice the dog just now??? there you can see what colors they have to been painted. these where my first ones from this awesome metal series. Thank`s for the link Remco,very nice work,and very colourful even to my eyes.I must try to find some time each day to wander down memory lane on this Forum to see those older post`s. I realise that only being a member for nearly a year now,that I have perhaps missed some amazing work. Some mail arrived from the Far East yesterday and some more of the collection is set out below. I have a few doubles,but I am very pleased with the new figures. There are a few doubles now,but one has to buy job lot`s to obtain the prized figures. I`m very pleased to have the Roman figures,they seem the hardest to find. There are a few more to collect as yet,but most have been spotted and where about`s traced. As Sir Arthur Conan Doyle wrote ,"The game is a foot " to obtain them. Gradually these metal and plastic collections are being built up,but perhaps the missing few might well mean I fail in the end. I would dearly love to be able to show them all on this Forum,and then ask Remco kindly to paint them . " Just Joking!" Paul, Remco only paints twelve figures a year! You will have to wait for a very long time! Peter wrote: Paul, Remco only paints twelve figures a year! You will have to wait for a very long time! And me painting them for you.... would indeed take years. 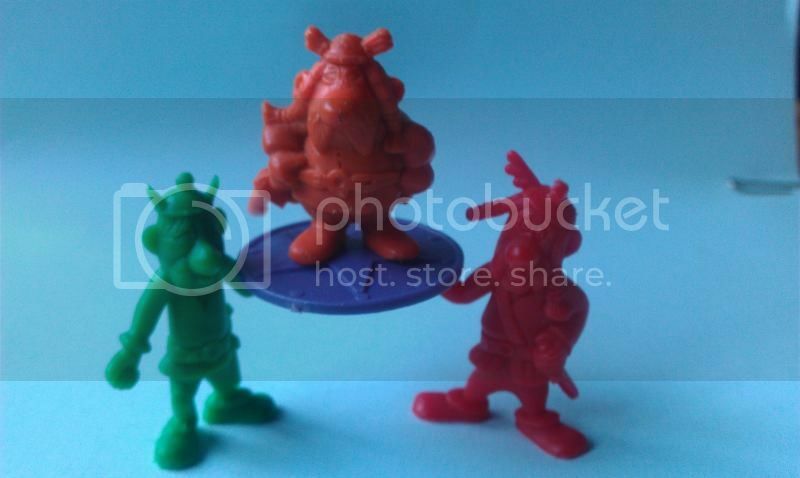 I lucked in today guys,I have obtained more of the plastic Asterix figures I mentioned earllier . More doubles but among this lot some nice ones that I definitely need to help my collection come that much closer to its end. Another good half dozen Romans too.I got them way under the price I was prepared to pay,and the Seller settled for half what he was originally asking.So in the end he was happy to sell them,and I was more then pleased to have them. HoScaleGeek,Thank`s for the info on the names.I am sorry that I forgot to answer your question," Are the figures rare in Britain? ",well they are,however it would be easyer to say that I am too. Being housebound and tapping my one good typing finger is the only way I can shop and obtain these little fellows.Asterix and Obelix figures as far as I know are not that popular or widly known or liked in Britain.I guess those who have seen the movies are familiar with these cartoon caricatures ,but people of my generation are not.Or perhaps it is just me,because I have always hated Chewing Gum! I do so appreciate good questions and comments,and I do like to keep up with them but sometimes I forget too,( My Age I guess ) so thank you HoScaleGeek, and all you other guys for taking an interest in this topic.
" Asterix,Do you think BB will ever remember all our friends names?" "Well,I suppose it could be possible,but according to Fred and MayBell its taken a lifetime for him to remember his own." "That's right in what they are saying about BB.After all I arrived way before they all did,and still he keeps calling me Micky! And I ain`t! My name is Cursor,and BB copy`s each and every file with just one click of ( ME ) his mouse!" Some very nice but of course quirky Asterix figures arrived Saturday,and I am so pleased to see them all. I hope you like the photo`s. I believe those two above should be holding something,but I do not know what.Perhaps you might know? The Lady looks very Dogmatic! Or should I have written Dogmatix? No Dogmatix, that`s the name of the tiny dog in G Britain. The fine little fellow above with the feather is I suppose quite rare,because I have two more but the feather has been knock off.So I have this fine example in Mint Condition and so he is very fitting for my growing fun loving collection. As seen above ,very nice to have another two complete set`s of Obelix.Does anyone know just why he lug`s that stone around? As you see rather bright Yellow ,and Orange plastic figures to go with the blue ones that were my first purchase out of this cool range of bygone figures! Those figures are very very nice ! 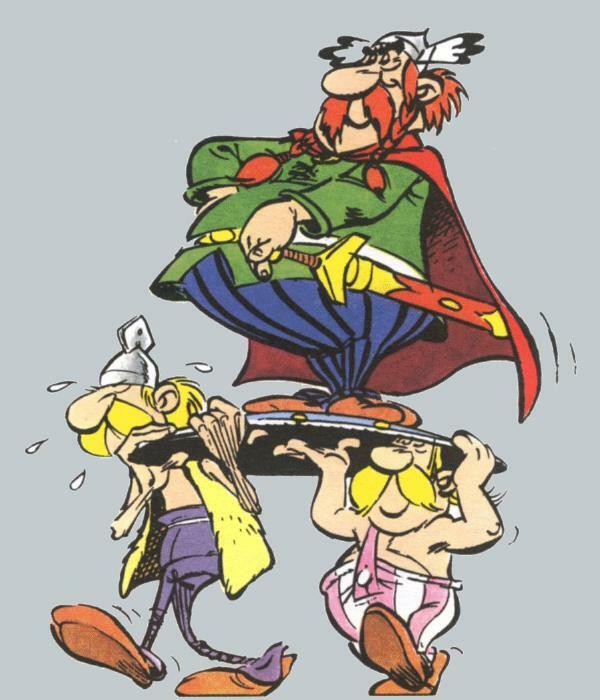 I think that they are the ones who carry the Chief Vitalstatistix (Abraracourcix, in french) on the shield. Does anyone know just why he lug`s that stone around? He builds the menhirs and he delivers to its customers! oh! and I like the palisade ! I did set up the pose with the chief on top. But the shield is thin, so I have to think of a good way to solve this. My! Oh My! Do you know ? That if I stayed up 24hrs a day I`d really have no extra time to read other comic `s ,I am far to busy reading the Dandy and yes you guessed it the,Beano after all I am quite a BB. I have a large shield like thing with a large star on it that came in the last packet I opened,so would this be the right one to use or is there another? Perhaps a jolly good picture would be nice to view if you could fix it up Remco, by using blue-Tack or in fact very sticky Bubble Gum! Now I think that's funny. High time to start reading this classic comic, BB. Start with the early ones and pray for a good translation. Pretty hilarious! Thank`s it`s nice to know how the pieces go together,however I`ve not got the proper figure to stand upon the shield as yet. Now in the meantime this does appear to be a somewhat of a Carry On! And the proper figure is standing on your shield first, his name: "Abraracourcix"
The plastic Bubble Gum figure collection so far has cost, £ 44.40p This is not with postage included. I have nearly the full set,that is if Dogmatix was included. Way back in the Day 1970`s the lables were all misprinted to contents and set numbers.A small thing really,but a big problem years later trying to collect them. There are only 8 figures to a pack,not the 10 as stated,and I believe there are 36 items to this set not figures. The metal Asterix figure collection so far has cost,£180.91p. This is not with postage included. I need C1707a, to complete set. I need C170Ih,C170Ih, C170IK,and C170Id to complete the Gauls set. I need C1702p,and C1702o to complete the Romans set. 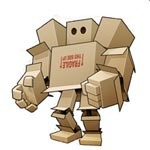 Shopping Worldwide,can quite often mean that the shipping cost can be equivalent,yes equal to the cost of the item. How many bubble gums did you chewed so far Paul?